Orange Pi Mini 2 is H3 based development board produced by Xunlong. The concept is based on the original Orange Pi Mini. Both, Orange Pi 2 and its smaller cousin Orange Pi Mini 2 were released in March 2015. 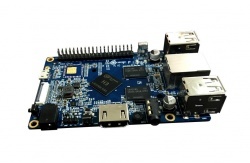 The board is based on a quad-core H3 CPU, and offers a TF card slot, onboard Ethernet (10/100M Ethernet RJ45), 40 pin GPIO and 4 x USB type A connectors, but does not come with WiFi or a SATA port like the A20 based original Orange Pi Mini did. The H3 SoC support has matured since its introduction in kernel 4.2. Most of the board functionality for boards such as Orange Pi Mini 2 are available with current mainline kernels. Some features (hw accelerated crypto, hw spinlocks, and thermal) are still being worked on. For a more comprehensive list of supported features, see the status matrix for mainline kernels. In addition, legacy 3.4 kernels are available in various work-in-progress git branches. Use the orangepi_2 (as a workaround until Orange Pi Mini 2 defconfig is available) build target. The U-Boot repository and toolchain is described in the Mainline U-Boot howto. Use the .fex file for generating script.bin. Use the sun8i-h3-orangepi-2.dtb (until a dedicated dtb is available) device-tree binary. The button marked SW3, located between the HDMI and TTL UART, triggers FEL mode when pressed during boot. For those with a transparent case (or no case at all) the Orange Pi Mini 2's LED activity is good. The red power LED (D7) can be turned off. The UART pins are located between DC input and Uboot Button(SW3) of the board. They are marked as TX, RX and GND on the PCB. Just attach some leads according to our UART Howto. Do not connect the red wire (VCC or 3.3V/5V), as that might damage your board. The original Orange Pi and Orange Pi Mini were released in November 2014. The Orange Pi 2 variant was also released in March 2015. This version also comes with onboard WiFi. There are several websites about Orange Pi Mini 2 and claiming to support it. It has to be clarified, what is "official" and who is behind this sites. A various amount of prebuilt images is provided via OrangePi's Website. This page was last modified on 4 December 2018, at 05:58.